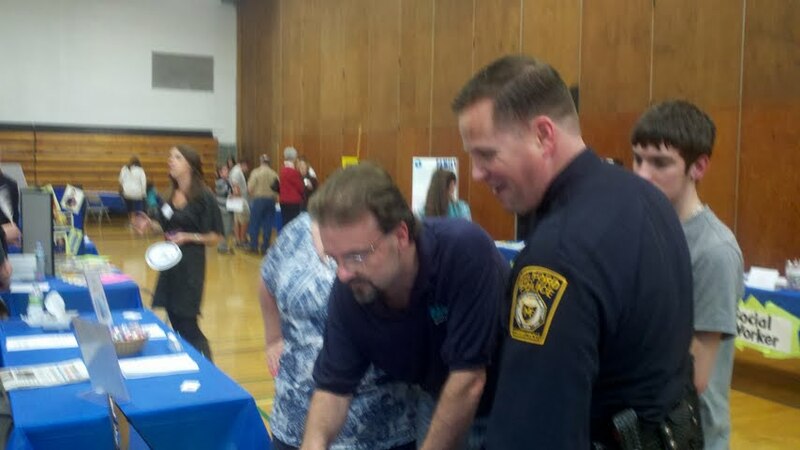 Last night I attended a Milford Public School Business expo at Jonathan Law High School. I had no idea what to expect. I brought tons of copies of the paper, and an informational sheet on how people can get a hold of me and other departments at the New Haven Register. I was happy to see some familiar faces including Milford Police Officer Jeffrey Nielsen, Architect William Silver, Musician Jay Rowe, Schools Personnel Director Wendy Kopazna, and of course Mayor Ben Blake and Superintendent of Schools Elizabeth Feser. More than 20 business professionals crammed inside Law’s gymnasium, which became very hot. The star of the evening was Parent Cathy Berni, who made sure everyone had bottled water. The event itself was a lot of fun. Clearly, the Milford police and fire department representatives received the most attention. That shouldn’t be a surprise. But many parents and students of all ages came over to take a free paper, and ask me questions about what it takes to be a reporter. Honestly, I tried to answer their questions the best I could, but I’m not sure what it really takes to be a reporter anymore. I don’t mean that as a negative comment, but it’s true. I’m learning too. When I started covering Milford in 2000 my job was to go out into the community, find the news, and report it. That’s it! Now I need to be fluent in social media, blogging, taking and editing video, and even knowing how to interpret metrics. Everything has changed. As a person who hates change, it freaked me out to say the least. I joke I can barely turn on my computer and now I need to be tech savvy, what kind of future do I have? But over the past year I feel I’ve slowly been learning a bunch of new digital tools. This is where we are headed. We’ve long begun the shift from print to digital first, but it’s a dance of sorts. We don’t want to kill the print revenues, which still pay a lot of bills, but we need to get the clicks on our stories online so we can receive more revenue from online sources. The reason I point this all out is it’s funny that I disseminated newspapers the last two days to the public. It seems more appropriate if I would have given out smart phones, and computers so people could make it a habit to go to www.nhregister.com to read my Milford stories and my blog posts. Yeah I don’t think we have a budget for that. Sorry! And it’s funny a lot of people assume the media is a dying industry and we’ll see about that, but several Milford students last night said they were working on writing news articles for class projects, even as young as the elementary school level. That was truly encouraging to see. Also several students said they like to read the paper, also really good news. I enjoyed the business expo and want to thank Kathy Bonetti for the invitation.